I really love a good list. And twenty is such a lovely round number. Plus, I’m going to milk the twentieth diaversary thing for as long as I can. Or at least until I bore everyone. And myself. On the day I was diagnosed, I was given a meter. It came in a padded navy bag and had a cream-coloured lancet device. The meter looked quite similar to a basic BGL meter today. And it took twenty seconds once the drop of blood was placed on the strip to countdown to give me my reading. I know, twenty seconds! Barbaric! There have been a lot of advances in DTech in the last twenty years. Some of it has been incredible (CGM, Flash, advances in pumps, better insulins); some…not so much (hello GlucoWatch!). But either way, I’ve always been interested in the latest technologies and have wanted to get my hands on it as soon as possible. It’s not all been great. But I’ve always learnt something when I’ve tried something new. So, here are twenty things I’ve learnt about diabetes technology. There is no one way to do diabetes technology. This fits into the My Diabetes, My Rules thing again. You don’t need to use the latest and greatest if you don’t want. If you are happy with using a BGL meter and MDI, keep going. AKA: If it ain’t broke, don’t fix it. Unless you want to. And then knock yourself out. An insulin pump is just a way to deliver insulin. That’s all it is! It’s a fancy way to do it, but it’s just an insulin delivery device. There are other ways to deliver insulin, so if you don’t want to pump, that’s perfectly okay. But if you do want a pump, learn to use it properly. I spent the first three years pumping not having a clue with what I was doing because I was trained by a rep from the pump company who just wanted to get in and out as quickly as possible. I learnt what the buttons did, but had no idea about anything else. I learnt nothing about carb counting, or how to make adjustments. My basal rates were wrong, but I couldn’t fix them because I’d never understood how to. That actually goes for any sort of technology. You won’t get the most out of anything if you don’t know how it works. So…find HCPs who know DTech, will support whatever you want to use, are up to date with the latest technology and are okay with you customising your devices to suit your needs. Once you find those awesome HCPs, listen to them. Learn the rules for your Dtech devices. And then break them to suit you. Being deliberately non-compliant only works if you know what you’re being deliberately non-compliant about! And further to that, after listening to your HCPs and reading all the official information and documentation, find out the truth about diabetes technology! Turn to your peers and learn how to use it in real life. I can honestly say that every single tip and trick I have learnt when it comes to DTech came from other people with diabetes. Peer support for the win! Just because you have decided to try something doesn’t mean you have to use it forever. If you decide that tech isn’t for you, put it away in a drawer, or pass it onto someone who wants to use it, and go back to what you were doing before. Or switch between the two. DTech is not like a puppy – it can actually be just for Xmas! Dtech may not necessarily make your diabetes easier to manage. Sometimes, it can feel like (and may be) more work – especially at first. Those of us who have been using different devices for some time can forget that. Just because one brand is the market leader and has the flashiest flyers, or your HPC wants you to use it, doesn’t mean that’s the one to go with. Look at all on offer and work out which one works best for you. And if colour is important (or anything else about the way it looks), and you’re using that as a factor when making a decision with which device to choose, that is perfectly fine! Diabetes technology is not a luxury item and don’t let anyone tell you otherwise. I once had a politician ask me when I was giving a presentation at Parliament House why it should be up to the Government to fund my ‘Mercedes Benz DTech’ when there was a perfectly suitable Hyundai option available. We had such a fun conversation after that…?! The playing field is not even. Some diabetes technology is expensive to use and out of reach of a lot of people. This is unfair. And sometimes, it’s really hard to talk about DTech access when people can’t access insulin. Going old school and analogue is perfectly fine if that’s what works for you. Sure, there are brilliant tracking apps (hello mySugr! ), but if you really want to use a record book and pen, knock yourself out. DTech can be overwhelming at times. There can be a lot of data available all of a sudden and it is perfectly understandable if you find that it’s a little bit too much to manage. 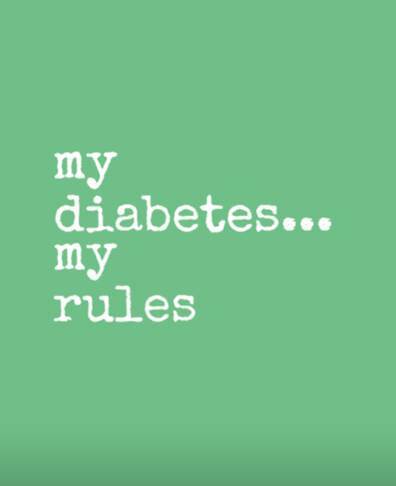 Don’t compare your glucose graphs to someone else’s. Their diabetes is not your diabetes. Just as you don’t need to use the latest in DTech, you don’t need to know all about everything new or emerging. But it makes sense to keep an eye out if you can. Find a trusted source that gives sensible information that is up to date. Some great places to start include diaTribe, Diabetes Mine and A SweetLife. One thing I know, No matter what the DTech is, it beats urine testing to learn you are normal, +1, +2, +3 or +4 whatever the heck that meant.